The concept behind the bike is to eliminate the paradigm of the welded tubular frame. Welded tube frame are labor intensive, require expensive jigs and fixturing, and the quality of the weld is very much dependant on the quality of the welder. In contrast, the RV100 frame components are cut on a numerically controlled machine (CNC). This makes the production of parts very repeatable, and makes the production of unique parts routine. Very, very interesting technique, and also pretty interesting to look at, even for a test mule. 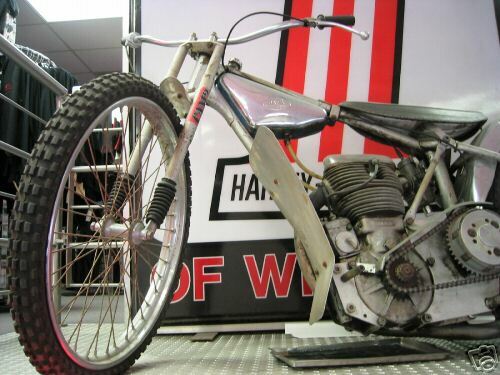 Up for auction is a Jawa Speedway racer ! This is a alcohol burning 90 HP 500cc bike with no brakes! What a trip to ride! The bike is complete, runs and is very good condition with no damage . The tires are in very good condition. Study the pictures if interested, what you see is what you get. J.T. Nesbitt and former Confederate employee Dave Hargreaves have begun a new design company located in the French Quarter of New Orleans called Bienville, and they've got some conceptual work on display. Mostly hand-drawn, which I find interesting. Their QuadRacer concept is particularly appealling. Stop on by and check them out.